California employment increased in December 2018 over the prior month, generating a modest year-over-year increase of 295,100 jobs for a total of 17,435,100 jobs. For comparison, job numbers peaked at 15.7 million in 2007 before the Great Recession. However, California’s working-aged population has increased by nearly 1.8 million since the beginning of the Great Recession, while the number of jobs has only increased by 1.7 million. 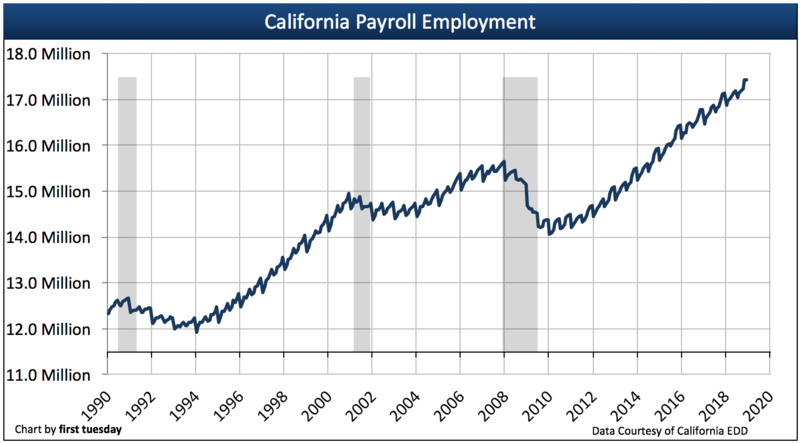 Thus, employment in California has nearly reached its full recovery. The state is expected to return to its pre-recession employment level in 2020. Nationally, the year-over-year increase in employment for December was 2.6 million, of which California was 11.3%. While today’s rate of employment in California is stronger than the nation’s, it has decelerated consistently from its annual year-over-year peak of 544,500 in July 2015. The present pace of wage growth is slightly greater than the inflation rate and still accelerating due to declining unemployment and underemployment, as well as increased labor force participation nearing optimal levels. Today’s continuing demand for additional employees is assurance of an increase in wage inflation. But wage increases still fell behind home price growth in 2018, contributing to slowing sales. Looking forward, rising interest rates, a lack of construction and decreased confidence in the economy will continue to stifle home sales volume in 2019. Home sales won’t pick up again until after the next recession, likely 2021 or 2022 as local governments correct restrictive zoning. Updated January 24, 2019. Original copy released October 2009. All forecasts are made by first tuesday. 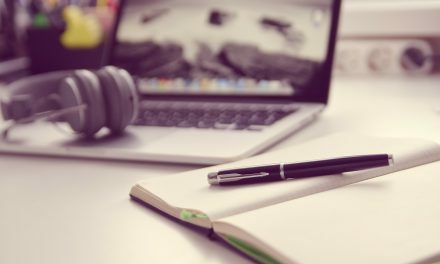 Forecasts are based on current data, influential factors and market trends. The charts above track the single most important factor in determining the past and future of real estate in California: the number of people employed. 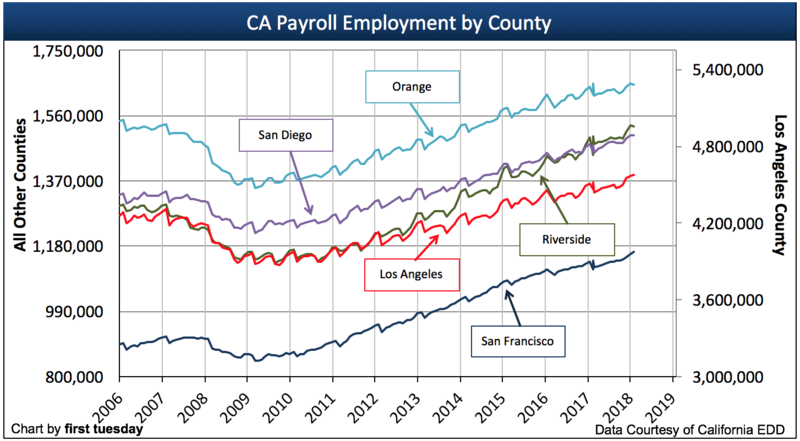 These charts review total employment numbers statewide and for California’s five most populous counties. The gray bars in Chart 1 indicate periods of recession in the United States economy (as tracked by the National Bureau of Economic Research). In the single month of June 2018, California gained 28,200 jobs, an improvement of 300,300 jobs over June 2017. It took California over six years to recover all jobs lost during the 2008 recession. 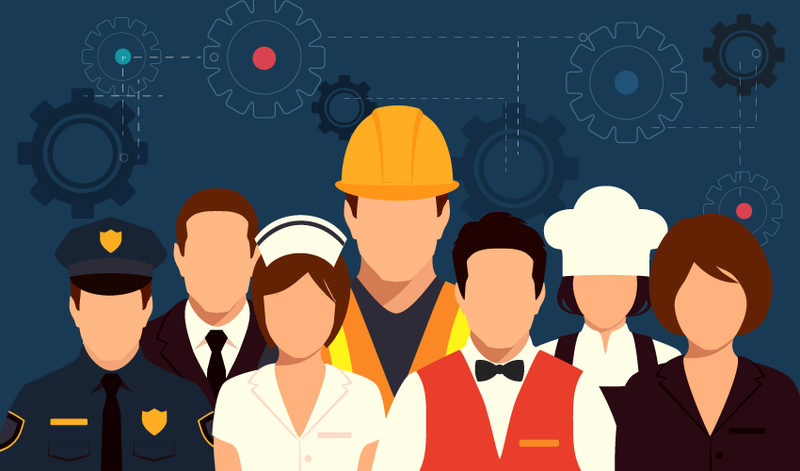 Despite the increase in job numbers, California has only gained 1.5 million of the 1.6 million jobs needed to make up for the intervening population increase of working-aged individuals, and has yet to reach a full jobs recovery. The quantity of jobs in California directly impacts statewide homeownership. Without a paycheck, nobody can afford to rent an apartment or buy a house (unless they are subsidized by the government or possess substantial independent wealth). any government subsidies available to the jobholder. Of all the factors affecting our economy, however, employment throughout California’s population has the most impact on the vigor of the real estate market. This is true in good economic times, times of financial crisis or economic recession. Demand for all types of real estate increases with the number of local jobs, as during periods of economic development or boom. Additions to the local labor force tend to drive rents and prices up on properties in the vicinity and results in local construction of homes and apartments. the movement of rents and prices paid for the use and occupancy of all types of real estate in the following 24 to 30 months. types of jobs existing and developing in the local market. For instance, if a community relies heavily on the construction industry (such as the Inland Empire during the Millennium Boom), then changes in that industry will certainly impact the local housing market. In the Inland Empire, the employment picture became particularly grim following the downfall of the construction industry. Historically, jobs in California create homeowners and tenants on an approximate 50:50 basis. Roughly half of all households own the residence they occupy and the other half rent. This ratio became badly skewed during the Millennium Boom when the California homeownership rate increased to an unsustainable 61%. Our state’s homeownership rate has declined dramatically since 2006. As of Q4 2017, the homeownership rate is 55.1%, just at our state’s stabilized equilibrium rate of 55% before the Millennium boom. This rate will remain weak through 2018 at least. It is unlikely to rise due to inflated home prices and the increased tendency to rent in urban locations, where the better paying jobs are found. the economics of the jobs (read: numbers, skills and pay levels) held by the local population. The unemployment rate has no effect on the present real estate market. The unemployed and underemployed do not rent or buy real estate — they first need a full time job to do so. The loss of jobs has a ripple effect on all types of real estate beyond SFRs. As employees are shed, the need for office space, commercial space and industrial space is reduced by an equal or greater amount. Subleases, reduced rents and vacancies across all segments of California’s real estate economy are the direct results of job loss. As nonresidential vacancies increase, single family residential (SFR) vacancies likewise increase. At the close of 2016 (the most recently reported Census year), California had 8 million SFR units and 16.7 million individuals employed, according to the U.S. Census. Thus, California had slightly less than two-thirds as many homes as people on payroll. More meaningfully, 55.1% of households in California own the home they live in as of Q4 2017. Most homeowners are employed. Thus, with every ten jobs lost, six people will not be able to purchase a home or retain the home they already live in (unless they have cash reserves). The remainder simply cannot afford to pay rent and will lose their housing. The reverse occurs when payroll numbers increase. While readers observe payroll data as reported by the media or others, they must be certain to distinguish between what is happening to California jobs and what is taking place across the rest of the nation. California took a disproportionately greater hit to jobs during the 2008 recession in comparison to national averages. The magnitude of California’s real estate bubble exceeded those of all other states (except Nevada and Florida) in terms of its negative impact on price, lending, construction, speculation and anticipation of demand. The recession’s impact on the housing industry was equally severe. In turn, the recovery will continue its long, bumpy plateau path as we correct for the recent past’s excesses and regulatory groundwork is laid for stable, long-term job growth. What happens in a commodity economy such as Texas, and in every other state, has little relationship to what happens in California, a state defined by much more than the continental divide. Jobs are further localized within California’s individual counties. San Francisco is the only county which has regained (and exceeded) all jobs lost during the recession when considering population gains since 2007. This is primarily due to its large technology industry, which has swiftly recovered. Other counties, particularly Los Angeles and Riverside, have a long way to go. These regions were heavily dependent on the housing and construction industries during the Boom and have struggled since. Therefore, when constructing your own local jobs forecast, the types of jobs available are significant to the job market’s rate of growth. This information is available from California’s Employment Development Department. 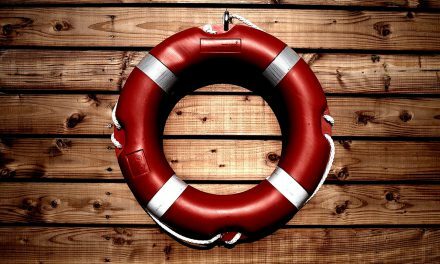 PreviousMay a lender prevent a homeowner from curing a mortgage default outside of a mortgage modification? NextMay dinosaur fossils be considered part of a property’s mineral estate? It is a fact that the real estate market is extremely complex and has a whole lot of factors ( not just jobs) that cause it to move up and down. I have observed that First Tuesday keeps posting articles about the real estate market that just don’t tell the whole picture and so are invalid and not accurate in the point they are trying to make in that article. ( which is their attempt to attribute some one factor, or another, as the prime cause of real estate market moving up or down. Then why do you keep reading? To be honest, I did not read the whole article, but anyone who tells you this cycle will be so many years, or whatever else is living in the past. I cannot believe how many times I was told this or that by qualified, or non qualified individuals. I would take many of them seriously, do my own due diligence before the internet could accumulate such details and found that over a life-time the only money you should gamble with is Personal Excess Cash and how many of us working stiffs have that and not Loaned Funds for a home or business. Of course we all need a reasonable place to live, preferably something we have some equity in, but anything else is gambling, and in many cases we have to retain funds for the unexpected, both pleasant and un-pleasant. It is a difficult tight rope walk and not everyone will make it to the other end. Quite simply, I have survived under my own steam engine, having to repair it along the way, but being born with average intelligence, ambition, guts, etc. would have been so much easier if I was born into a filthy rich family, or am I testing fate the next time around. Do not let the “fundamental” factors affect your investments!!! Just do market timing! Aka buy at the bottom and sell at the top! Same cycle since WW2! 7-12 years up and 7-12 years down! Each peak is double the past peak & each bottom is double the past bottom! AKA I sold 198 properties from 2000-2007! Gross profit each 1167% IRR net net net 27.12%/month for all 198 escrows! PS: 4 semesters of calculus helped me understand & take advantage of the markets. What you’re referring to is the classic 14 year RE cycle (6% annual appreciation) which would have peaked in 2007, bottomed out in 2012-2014, and will most likely peak again in 2020, 2021 respectively. Not sure why you’d have to take 4 sems of Calc to figure out this basic axiom. I like first tuesday for their testing, I can send in my test & know it’s going to be handled correctly. I ‘am ready for my broker test, but I need some money to pay for the books & test! so i think i’m going to try reebrokers, but I do wish to hear from you on the business? I have so many questions about the pay-out of my commission, is it mailed, or placed in my account? what about escrow? who is the broker? or Brokers?